"The Creator of all things rests in the tabernacle of the virginal womb, because here he has prepared his bridal chamber in order to become our brother; here he sets up a royal throne to become our prince; here he puts on priestly vestments to become our high priest. 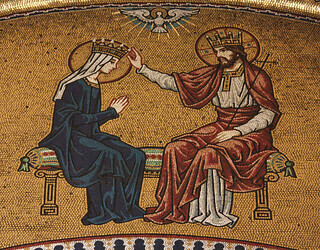 Because of this marital union, she is the Mother of God; because of the royal throne, she is the Queen of heaven; because of the priestly vestments, she is the advocate of the human race". 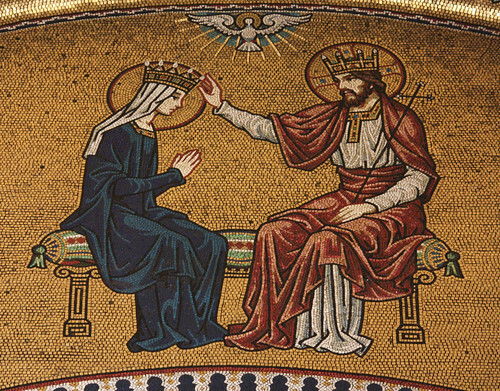 My sermon for today's memorial of the Queenship of Mary can be read here. Mosaic detail from the Lady chapel of Westminster Cathedral.